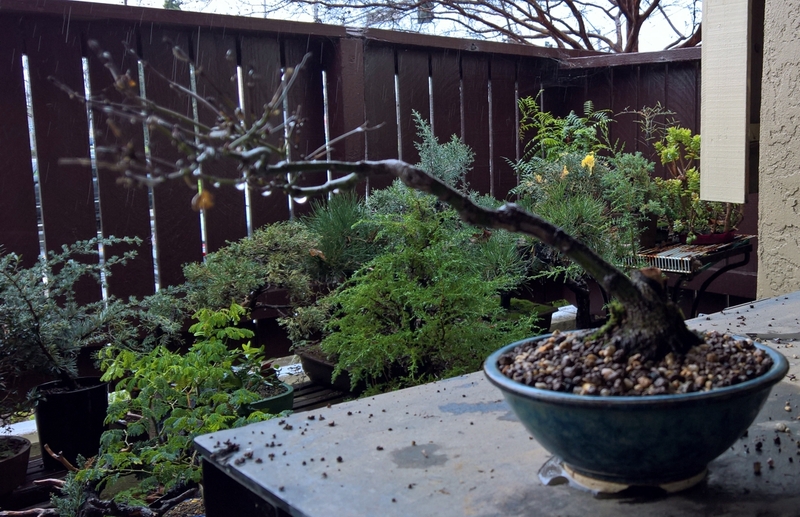 It has been a very odd year for bonsai in northern California this year. We have been having extremely mild temperatures and tons, and I mean tons, of rain. This after 5 + years of drought has turned our schedules into mud. Along with the rain comes the need to improve drainage by tipping pots, rotating them of often, sheltering some plants for periods of less water, severely interrupted re-potting schedules. Taking trees out of the rain for a few days to drain before re-potting is essential; otherwise, we rip roots and work in mud. There is too much moss everywhere and a constant effort must be made to clean the nebari of the trees to stop moss from climbing trunks. However, I can clean a tree and 5 days later have to do it again. Since temperatures have been so mild and wet we also now have to battle pests like adelgid in our pines, fungus in slow draining pots, and root rot. I am having to pull pines out of the rain, wait for a few days and spray them, and keep them out of the rain for a few more days. 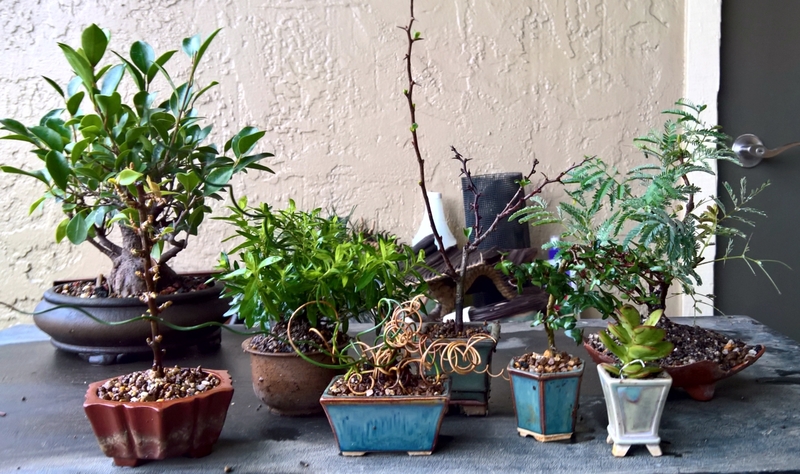 So I gave up waiting for the rain to slow or stop and just began re-potting the few trees I had on this year’s schedule. A Chinese quince was overdue and was going into a much bigger pot. It should have been done last Fall, so I know it will not bloom this year. I let it drain well and moved into its new larger pot. It has some thread grafts on it that will be cut this year and then I will have to carefully wire it with paper wrapped wire once the tree is well established in its pot. I got the chance to get to a wind influenced maple before it leafed out. It has quiet a story of its own. Also go my mame and accessory plants underway. Wind influenced Acer P. This was originally an air layer. I lost a whole top of the tree last year in the heat and drought so I am going to see what happens in this new pot. Chinese quince with thread grafts made it into a larger pot finally. You may notice a large cut root at the base; that was reduced in strength last year and had lost importance to the tree and was removed. I will work that down some more this year. Sheltered trees from the rain. A recent acquisition, small grape, is already pushing buds. 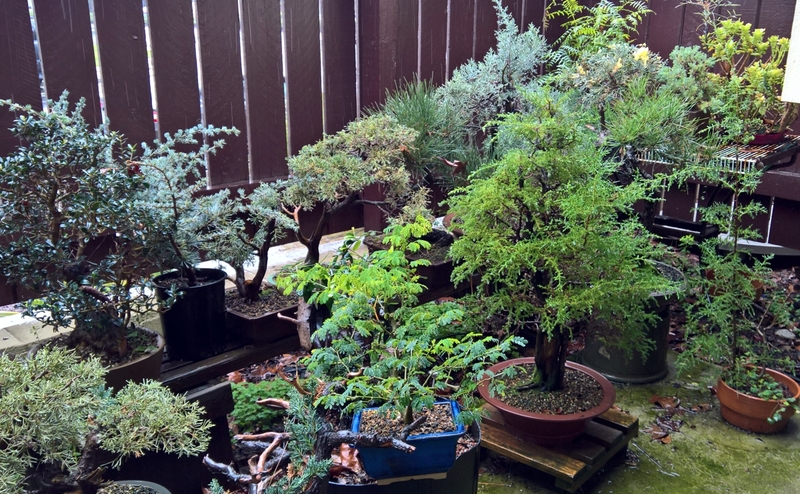 Most of these are tropical or semi tropical trees that have lived outside most of the winter this year. 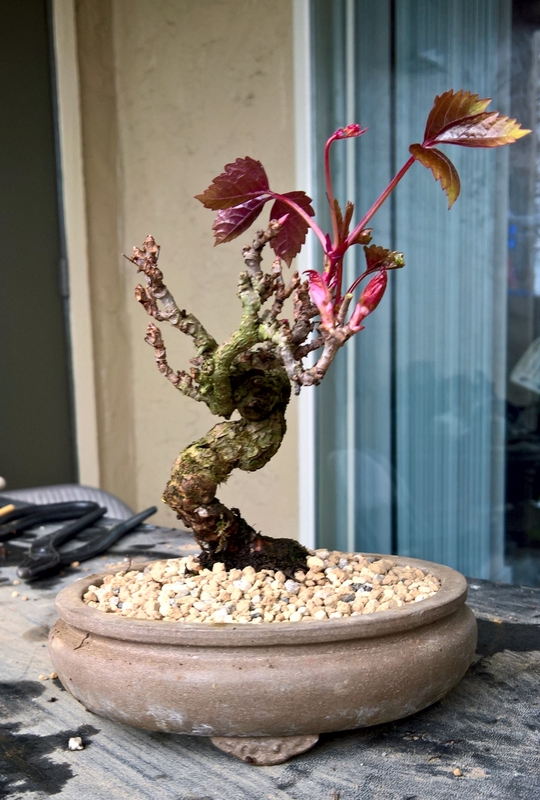 Boston Ivy, a recent purchase from a bonsai colleague of mine. 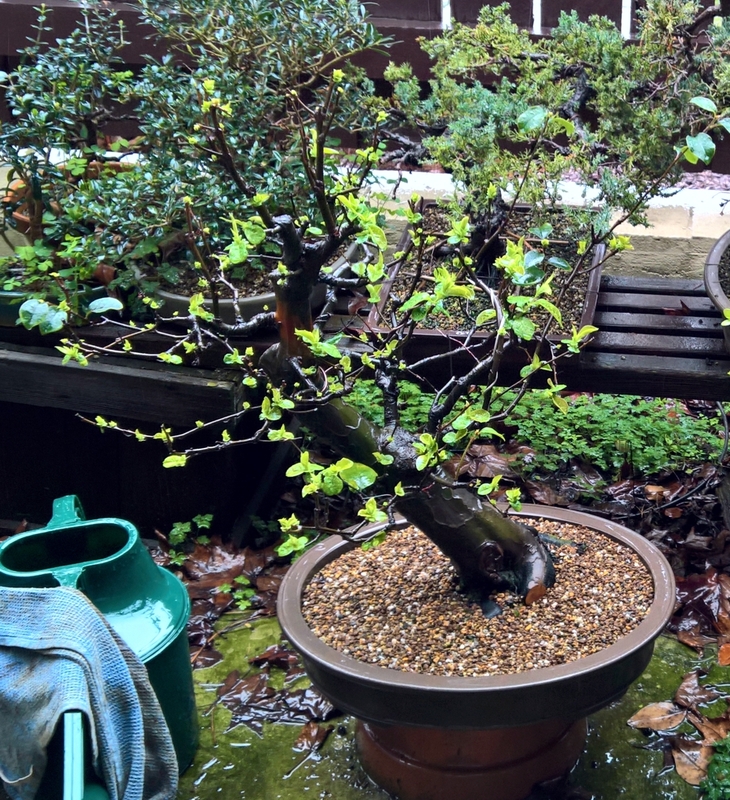 This is a very old tree that had not been re-potted in some years but has now moved into a pot to show its leaves and moving trunk. Wish I had the age of this one. Rain, rain, rain. Everything is waiting patiently for the sun. I think it looks my little dense forest. Mame pots were recently gifted my by a painter friend of mine. 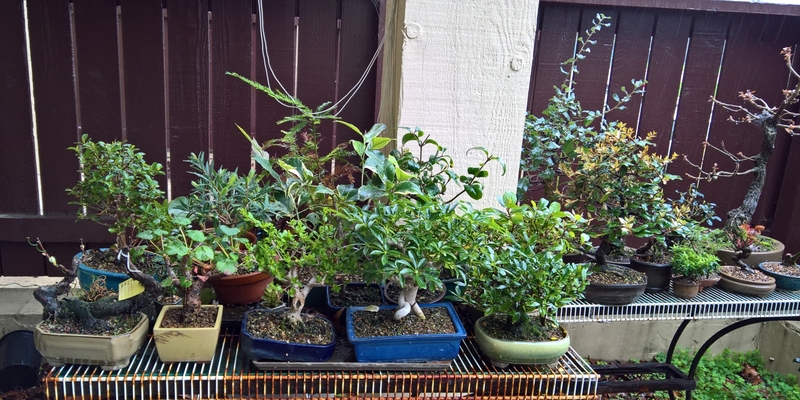 They are now hosts to accessory plants and some small bonsai trees that will be styled once they settle into their pots. 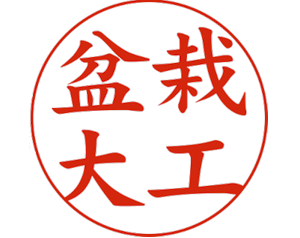 Mame in California are challenging with high heat and dryness. They will require shelter and tray with water all summer long.